I've been looking at the work of Keith Arnatt recently. He began as a conceptual artist who used photography as tool - he's famous for the piece where he wore a sign saying "I'm a real artist" and a series of images where he appears to be sinking into the ground. 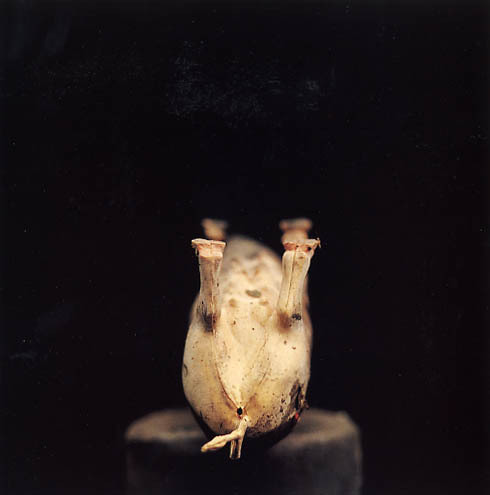 Later he reinvented himself as a photographer working on various series including photos of notes his wife left for him around the house and a series of photos of objects found on the dump (one of which is pictured above). I'm a Real Photographer: Photographs by Keith Arnatt is an excellent catalogue of his work. These illustrations by D'Arcy Wenworth Thompson show the shapes made by drops of ink in water (left) and the tentacles of a jellyfish (right). They are taken from a book called Chaos: The Amazing Science of the Unpredicatable by James Gleick and originally appeared in Wentorth Thompson's book On Growth and Form . .
Ì have just finished reading a book about randomness called The Drunkard's Walk: How Randomness Rules Our Lives by Leonard Mlodinow. The book aims to explain us the role of chance in everyday life. One of the interesting facts in the book is that people are not capable of making up a sequence of numbers that pass mathematical tests for randomness. For certain mathematical calculations strings of random numbers are required. In 1947 scientists at the RAND corporation created a system using electronic noise to generate random numbers. They did not succeed in generating a string of numbers that was entirely free of regularities but did produce results which were random enough to be useful. The numbers were published in 1955 as A Million Random Digits (which sounds like an avant garde novel or piece of early conceptual art). This is surely the most depressing book I have ever read. I am an amateur historian, who has spent many years analysing history and watching it repeat itself... or at least that is what I thought. After reading this book it is obvious that what I perceived to be recurring patterns, were if fact just random events being repeated randomly. As a result, I no longer read history with the same enthusiasm. On the bright side, this book is a wonderful testament to man's ability to think the unthinkable. It also questions my sanity that I tried to read it in the first place! I took a class in statistics in college. I used this book to help me select random phone numbers for a poll I was conducting for my class project. (The most popular household cleanser in the greater Siouxland area is Bon Ami, by the way.) One of those phone calls was answered by the woman who is now my wife. We've been happily married for ten years! Thank you, RAND. They show an example of 'normal distibution'. To explain this idea Mlodinow writes about an experiment in which 300 students were each asked to guess heads or tails in a series of ten coin tosses. When these results are presented in a graph they form a bell-shaped curve centred on 5 correct guesses. The curve drops to about two thirds of its maximum height between 3 and 4 correct guesses and between 6 and 7 correct guesses and tapers off in a bell shape with 0 and 10 correct guesses having the lowest heights. 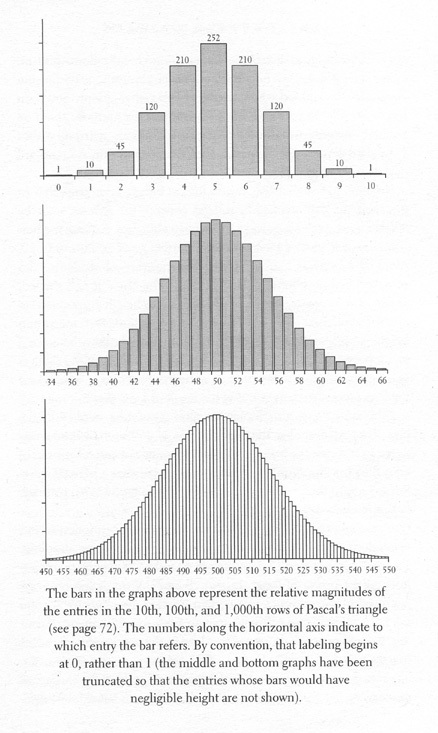 This type of curve is know as 'normal distribution'. The graphs below chart the number in rows of pascal's triangle - a chart which can be used to show the number of possible combinations of given set of elements eg the number of ways 100 people can be seated at 10 tables. There's a booklet with today's Guardian called "How to write fiction". There's a article by Kate Pullinger addressing on of the most common (and most annoying) questions asked of artists and writers. Writers are often asked the question, "Where do you get your ideas from?" as though there is a special place where you can buy them: Asda for chick-lit, perhaps, Waitrose for literary fiction. But, even though this question gets asked a lot, most writers find it difficult to supply a decent answer. The truth is that ideas are all around us, in the people you meet, in the things you read and see and hear and experience, in your own childhood and family, in the wilder reaches of your imagination. Matt Packer, the curator of the Lewis Glucksman Gallery, was interviewed about the Bookish exhibition for the RTÉ Lyric FM Arts Show. It can be listened to online here. The coverage of Bookish starts at 13 mins 56 second into the show. The exhibition "Bookish: When Books Become Art" at the Lewis Glucksman Gallery at UCC in Cork opened last night. My favourite piece in the show is John Latham's film which shows every page of the Enclyopedia Brittanica at high speed. The text has a strange, rythmic pulsing quality that appears animated and images flash up intermittently. My own contribution to the show consists of three wooden tables with objects that were found between the pages of books in the UCC library. The work also includes a video which presents a letter written in 1979 and a song by Joan Baez the handwritten lyrics to which I found in a book. Here is a preview of some of a new version of my Found Bookmark Project which I am working on for an exhibition called Bookish at the Lewis Glucksman Gallery in Cork. I searched the library at the University and collected a lot of material that had been left behind between the pages of books. I found some interesting stuff including a letter dated 1979 with a note added by another library user in 1983. The letter is a complaint about vandalism of the Encyclopedia of Philosophy and library security in general. A Laser cut book by Olafur Eliasson commissioned by MOMA. Each page represents a 2cm cross section of Eliasson's actual house. I'm currently reading Will Self's first novel My Idea of Fun . It's the first thing by Self that I've read and it reminds me of Martin Amis. The dark humour and absurdly matter of fact attitude towards violence and depravity also reminds me of the David Shrigley cartoon Who I Am and What I Want which I posted a while ago in.